Julie initial came to me and wanted to lose weight and improve overall health. After years of focusing on her career it was time to wind back the clock with regards to health and fitness. Being the hardworking and driven lady that she is she managed to lose 35lbs (2.5 stone) in just 3 months! Alongside training with me 3x per week, she also religiously followed the nutritional plan that I designed and did everything I asked outside of sessions – gym workouts, etc. 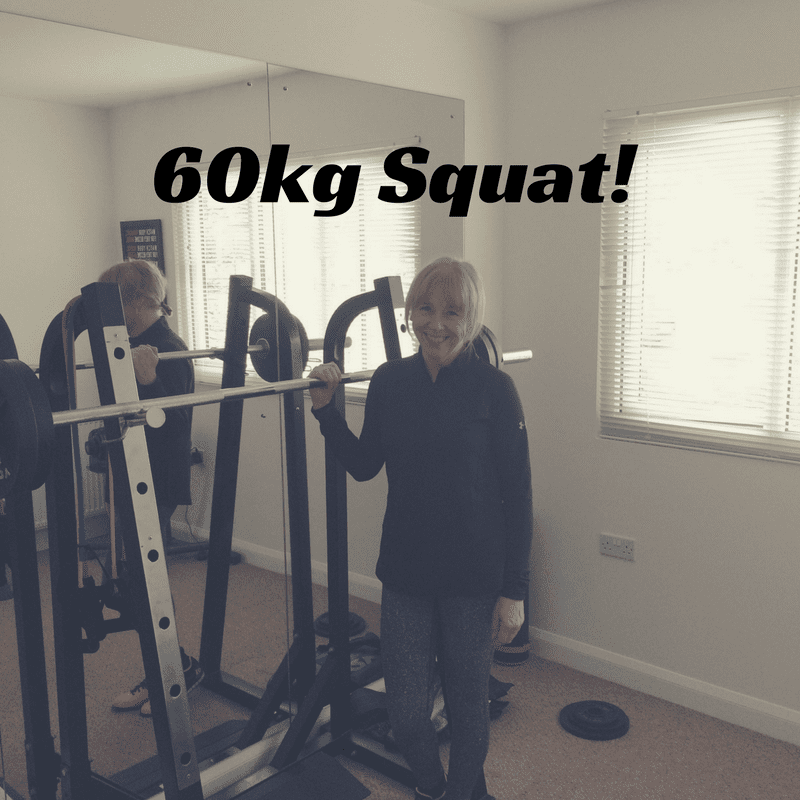 After the weight loss goal was achieved, the aim was to keep improving fitness, and strength and she came up with a new goal of squatting her own body weight on her back – 60kg! It was a highly ambitious goal because there were a lot of issues with strength and flexibility – meaning that it was going to take time to achieve her goal – a lot longer than the 3 months it took to lose the weight! When Julie started working with me we were only performing basic squats due to the lack of strength and mobility across joints/muscle groups such as the hips, ankles, glutes and hamstrings – either being too weak, too tight or having a poor range of movement. There were also imbalances in strength between the right and left leg – with the right leg being much stronger than the left. We had to go back to basics and build up from the very beginning. For the last 12 months Julie has trained with me 3x per week and every session is tailored towards improving her squat. We spend approximately 10-15 minutes each session warming up (doing active mobility drills, and foam rolling). We also spend time at the end of each session stretching out tight muscle groups like the hamstrings, glutes and thighs. Alongside the mobility drills we’ve also focused on strengthening the hamstrings and glutes using exercises such as the stiff legged deadlift, barbell Romanian deadlift, and different glute bridge variations. We’ve also paid attention to the imbalances between the right and left leg, by adding in split squats, single leg lunges, step ups and pistol squats. The aim has been to build up each leg separately and bridge the gap between the left and right leg. Every session we do between 6-15 sets of squats! Rep ranges vary i.e. We’ve also logged the weight lifted each session and aimed to add extra weight when possible. Overtime Julie has gotten stronger and stronger. Alongside playing around with different rep ranges, we’ve also spent months focusing on strength, whilst other months more towards endurance and a bodybuilding style of training – playing around with different rep tempos. Along the way there have been plenty of ups and downs, the ups being improvements in technique and increased weight lifted, the downs being plateaus – periods where strength has stagnated or at times gone backwards! Alongside working with myself, Julie has also had a fantastic team of specialists supporting her. Matt Thompson (Hallamshire Physio) has been a massive help in keeping Julies body healthy by doing soft tissue sports massage every 2 weeks. Alongside massage Julie also goes to a pilates instructor once per week. Between us we have managed to compliment one anothers work and combined with Julie tremendous work ethic/persistence today she has finally achieved her squat goal! For the first Julie lifted 60kg on her squat (with perfect form) squatting to a full 90 degree rep range! High five to Julie – what a great story of how hard work and determination pays off!